Medimurje County ( Croatian: , Kajkavian: Medzimurje; German: ) is a triangle-shaped county in the northernmost part of Croatia, roughly corresponding to the historical and geographical region of Medimurje. Despite being the smallest Croatian county by size, it is the most densely populated one (not including the City of Zagreb). The county seat is Cakovec, which is also the largest city of the county. 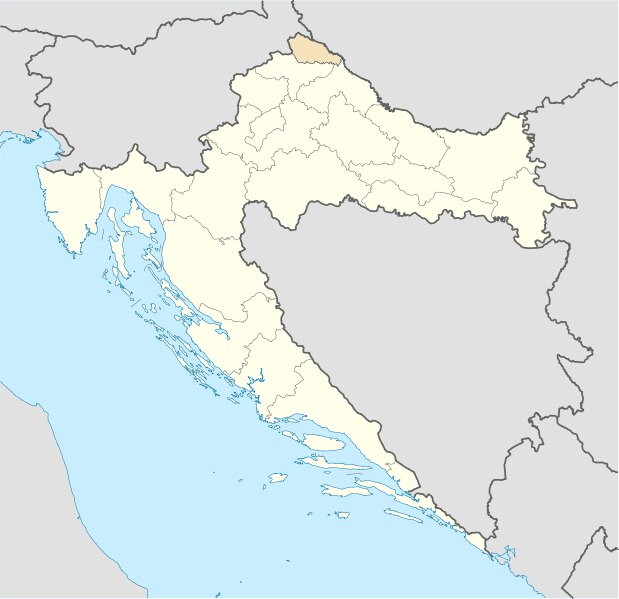 The county borders Slovenia in the north-west and Hungary in the east, with about 30 kilometers of Slovenian territory separating it from Austria. The south-eastern corner of the county is near the town of Legrad and the confluence of the Mura into the Drava. The closest cities include Varazdin, Koprivnica and Bjelovar in Croatia, Murska Sobota and Maribor in Slovenia, as well as Nagykanizsa in Hungary and Graz in Austria. The Croatian capital of Zagreb is about 90 kilometers south-west of Cakovec. There are slopes of the Alpine foothills in the north-western part of the county, the Upper Medimurje, making it suitable for vineyards. The south-eastern part of the county, the Lower Medimurje, touches the flat Pannonian Plain. The flat parts of the region are also largely used for agriculture, which mostly includes fields of cereals, maize and potato, as well as orchards, which are mostly planted with apple trees. There are two major hydroelectric power plants along the southern border of the county, on the Drava River. Medimurje County covers the plains between two rivers – the Mura and the Drava. The Mura flows along the countys northern border with the Slovenian region of Prekmurje and its eastern border with Hungarys Zala County, while the Drava flows along the countys southern border with two other Croatian counties – Varazdin County and Koprivnica-Krizevci County. In the middle of the county flows local river Trnava. There are two reservoir lakes on the Drava – Lake Varazdin and Lake Dubrava – both built to serve the two hydroelectric power plants based in the county. Lake Dubrava, located near the city of Prelog, is the biggest artificial lake in Croatia and the second largest lake overall in the country. The power plant using Lake Varazdin is named after the county seat, Cakovec, while the one using Lake Dubrava is named Dubrava, taking its name from the nearby village of Donja Dubrava. The countys elevation ranges between 120 and 344 metres above sea level, the latter being the elevation of its highest hill, Mohokos. Cakovec has an elevation of between 160 and 165 metres above sea level. Throughout the past, there were occasional earthquakes in the region. One of significant strength hit the region in 1880, while another in 1738 devastated Cakovec and particularly the nearby Senkovec. Of the countys total area of 729.5 km², around 360 km² are used in agriculture. Due to the high population density, agricultural land is divided into 21,000 units averaging 17,500 m2 (188,368.43 sq ft) each. 27.5 km² are covered with orchards. 11 km² is the hilly area, located in the north-western part of the county, with villages like Strigova and numerous vineyards. Grasslands and forests cover an area of around 105 km². The biggest forest is Murscak, located between Domasinec and Donji Hrascan. The first organized human habitations here can be traced back to the Stone Age. There is a Neolithic site called Ferencica near Prelog. There are archaeological sites that date from the Bronze Age, and 3rd century sites called Ciglisce and Varascine . During the Iron Age, the Indo-European tribes identified in the area were Celts, Serets and Pannons, and the region became part of the Roman empire. In the 1st century, the Romans knew the area as Insula intra Dravam et Muram ("island between the Drava and Mura rivers") according to the geographer Strabo. The region was part of the Roman province of Pannonia and later part of the Pannonia Superior. Cakovec was originally called Aquama ("the wet city"), because the area was marshland. During the Migration Period, many different tribes, such as Huns, Visigoths, and Ostrogoths, passed through the region. The region was part of the Kingdom of the Ostrogoths, the state of the Lombards, the Avar Khaganate, and the Frankish Kingdom. The Slavs, which settled this region in the 6th century, gained independence after destruction of the Avar Khaganate. In the 9th century, two Slavic states included this area - the Principality of Lower Pannonia and the Principality of Pannonian Croatia. According to some sources, the area was also part of the Great Moravia. Subsequently, the area was included into the medieval Kingdom of Croatia. There are spas used for recreation in Vuckovec and around Sveti Martin na Muri, both in the northern part of the county and near the Mura. There are also more than 200 clubs for various sporting and recreational activities such as mountaineering, fishing, bowling, CB radio, parachuting and flying small aircraft, including unpowered gliders and powered hang gliders. Hunting also attracts numerous hunters in low game and birds. For many centuries, Medimurje was part of Hungary, whose influence is evident in its history and culture. Once, the only notable place where one could have experienced the local cuisine and culture was Medimurska hiza, a restaurant near the village of Mackovec, about 5 kilometers north of Cakovec. The restaurant was heavily damaged by fire in the late 1990s and never reopened. However, a number of new restaurants serving the regions traditional food have opened over the years. The traditional food during the Fasnik period are a type of doughnuts known in Croatian as krafne, although the local people also use several similar names for the food. As well as being the traditional food of the Fasnik period, krafne are also a popular everyday food in the region and are sold in local stores and bakeries throughout the year. The traditional food of the Porcijunkulovo festivities is langos, whose name is spelled langos in Croatian. Another notable sweet food is a type of nut roll called orehnjaca, which is filled with walnut cream. Its name is derived from oreh, meaning "walnut" in the local Kajkavian dialect. A similar cake filled with poppy seed is called makovnjaca, with its name derived from mak, the Croatian word for poppy. There is also a type of corn mush called zganci, which is usually served with liquid sour cream, buttermilk or warm milk. Cottage cheese is also a popular food in the region. It can either be served with liquid sour cream to form a dish known in the local dialect as sir z vrhnjom, which translates as "cheese with cream", or used to make turos, in which case it is cone-shaped and dried. Sir z vrhnjom is often spiced with red paprika, which is also one of the main ingredients in turos. Cottage cheese is also used as one of the fillings in a pastry called strukli. Some of the other traditional foods of the region include a type of pasta called mlinci, white and black sausages, known as curke, which is served with sour cabbage, as well as other dried or otherwise preserved meat, such as meso z tiblice, which is stored in a small, usually wooden barrel called tiblica. There are also some vegetable dishes, while the production of wine is ubiquitous in the hilly landscape of the regions northwest. The diet of the region is part of the Croatian cuisine, which is known for its diversity. One notable traditional festival is the Fasnik, a carnival-like event held in February. The events name is derived from the German word Fasching, describing similar events mostly held in Austria and Bavaria. The festival has been observed for centuries, with masked people participating in public parades and celebrations to drive off the demons of darkness and winter. The main festivities of the Fasnik period are usually held in the centre of Cakovec, with a parade of masked people from the entire region walking through the citys streets to reach its central square, where a hanged hay doll representing the Fasnik is traditionally burned down to signify victory over the demons of darkness and winter, as well as to mark the end of festivities. Another notable and highly attended festival held in Cakovec is the Porcijunkulovo, an annual fair which takes place on the streets around the citys centre between 30 July and 5 August. At the fair, many of the regions traditional products, such as baskets, can be purchased and people can also see how some of the products are made. Many of the regions traditional foods are served during the festivities and there is a daily entertainment program at a temporary stage set up at the citys central square. Throughout its history, the region was heavily agricultural and even today many work in that sector. The total percentage of people involved in agriculture is 12.7%, which is above the national average. Since the 4th century BC, there have been ship mills in use, particularly along the Mura River, some of which remained in use until the 20th century. The last surviving ship mill in the county is also located on the Mura River, between Sveti Martin na Muri and Mursko Sredisce. It is now a historic monument and a well-known regional tourist attraction. The famous Medimurje horse (Medimurski konj) breed of horses was for many years harnessed to the streetcars of Vienna. Some of the largest food companies in the region include Agromedimurje, Cakovecki mlinovi and Vajda. METSS, formerly called Trgocentar, operates a large number of convenience stores in the region. In Cakovec, many people are also employed in a number of shopping malls run by local, national and international companies.